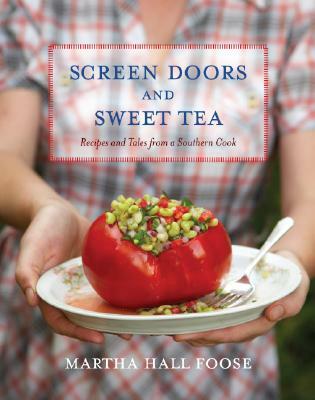 Screen Doors and Sweet Tea: Recipes and Tales from a Southern Cook (Hardcover) | Turnrow Book Co.
Born and raised in Mississippi, Foose cooks Southern food with a contemporary flair: Sweet Potato Soup is enhanced with coconut milk and curry powder; Blackberry Limeade gets a lift from a secret ingredient–cardamom; and her much-ballyhooed Sweet Tea Pie combines two great Southern staples–sweet tea and pie, of course–to make one phenomenal signature dessert. The more than 150 original recipes are not only full of flavor, but also rich with local color and characters. As the executive chef of the Viking Cooking School, teaching thousands of home cooks each year, Foose crafts recipes that are the perfect combination of delicious, creative, and accessible. Filled with humorous and touching tales as well as useful information on ingredients, techniques, storage, shortcuts, variations, and substitutions, Screen Doors and Sweet Tea is a must-have for the American home cook–and a must-read for anyone who craves a return to what cooking is all about: comfort, company, and good eating. MARTHA HALL FOOSE was the executive chef of the Viking Cooking School. Born and raised in the Mississippi Delta, she attended the famed pastry school École Lenôtre in France. She returned to Mississippi and opened Bottletree Bakery–a Southern institution in Oxford–and later, with her husband, Mockingbird Bakery in Greenwood. She makes her home in Tchula, Mississippi, on her family’s farm with her husband and their son. "This is one cookbook I would proudly have in my kitchen! It has great information and wonderful recipes!"